May Day, the first of May, has ancient Pagan origins. The Druids of the British Isles celebrated it and later, when the Romans took over and occupied the BI, they brought with them their own early May festival, the feast to worship Flora, the goddess of flowers. The two merged and in Medieval times the May Pole got added to the mix. In modern times May Day got taken over by the International Labor Movement. That concept apparently got going to commemorate the Haymarket Riot in 1886, a nasty labor rally that got seriously out of hand when an anarchist tossed a bomb. Socialists, communists and anarchists still celebrate the day big time and the few remaining countries that still suffer under Communism like the Peoples Republic of China and Cuba mark it as an official holiday. But for me, the 1st of May resonates because on that day in 1941 General Mills, a company located in Golden Valley, MN, introduced the product “Cheerios” to the World. 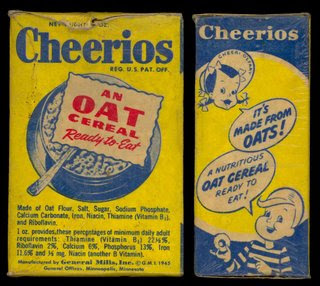 Until 1945 it was called “CheeriOats”, but became an instant hit anyway. The serious marketing push in 1945 came with the signing of the Lone Ranger (one of my favorites in my early years) to be their product spokesman. It was one of the longest lasting and successful relationships in brand marketing and lasted until the ‘60s. Cheerios, the first oat based ready to eat cereal, was invented by a guy by the name of James W. Evans, a professor at Central Missouri State University. I don’t know if Evans ever got rich off his invention. He certainly never achieved fame. But, ya gotta hand it to ol’ Jimmy- he invented a product with legs. It’s still plugging along in its original formula 67 years after introduction. Amazing. How many products can you think of with a better track record? Yeah, me either. Our company developed and released a credit card receipt printer in 1996 that lasted in its original design for ten years. We still sell small quantities of an updated version. I thought that was pretty good since most new products, especially technology products, last a couple of years, if that. It wasn’t until the 90s that Cheerios began marketing the health benefits to a more conscious populace, but they have always been free of artificial flavor or coloring. Cheerios has forever been low in sugar, fat and cholestorel and contained plenty of fiber and folic acid. Mostly, Cheerios persisted because they tasted good-especially with some berries or a banana tossed on top. Millions of kids have grown up on Cheerios and continue to munch on them as adults. Several generations of toddlers have been quieted in their high chairs when Mom tossed a handful of the little 0s on their trays while she prepared the rest of the meal. And, most parents traveling with youngsters keep a baggie of Cheerios handy to quiet the little nippers when they get the cranky munchies. Over the years General Mills provided gainful employment to hundreds of marketing types and they came up with a dozen different slogans. While the relationship with Kemosahbee was the longest in any brand history, they later became associated with Donald Duck, Rocky and Bullwinkle, Scoobie Doo, Star Wars characters and even NASCAR drivers. Of course, no marketing department worthy of its name could resist spin-offs. Over the years they introduced: Honey Nut, Apple Cinnamon, Multi-grain, Frosted, Team, Purely Os (organic), Team and Berry Burst. None ever eclipsed or even touched the original. With the expanding girth of today’s children, it seems unlikely the sugary spin-offs ever will. Cheerios and I share the birth year 1941 and I still love them. I always appreciated that the stragglers floated jauntily on the milk instead of sinking into a soggy mass at the bottom of the bowl. Unless you are a Communist or anarchist and choose to celebrate May Day in their fashion, I suggest a bowl of Cheerios on that day in honor James W. Evans. After skimming the last floaters, raise your bowl of milk on high in a silent toast to the estimable Mr. Evans. Way to go Jimmy! R.I.P.